Wi-fihacker.com How to Hack Wi-Fi using Kali Linux and aircrack-ng Wi-Fi Hacker April 22, 2018 Kali Linux can be used for many things, but it probably is best known for its ability to penetration test, or hack WPA and WPA2 networks.... In addition, the student needs a wireless router or access point that can be configured to use WEP encryption and WPA encryption and a USB wireless card that is capable of packet injection. How to Hack Wi-Fi using Reaver on Kali Linux. As one of many Wi-Fi hacking tools used on penetration testing with kali linux, Reaver implements a brute force attack against Wifi Protected Setup (WPS) registrar PINs in order to recover WPA/WPA2 passphrases.... WiFi Hacking with KALI Linux 2.0 (or KALI 2016.1) KALI Linux is one of the most popular hacking distributions out there. It contains over 300 different hacking tools and applications. KALI LINUX WiFi Hacking with KALI Linux 2.0 (or KALI 2016.1) KALI Linux is one of the most popular hacking distributions out there. It contains over 300 different hacking tools and applications. english bible niv free download pdf Kali has all preinstalled tools that are needed in wifi hacking like aircrack-ng (best software to crack a wifi). New tools like Fluxion will work only on Linux. New tools like Fluxion will work only on Linux. How to Hack Wi-Fi using Reaver on Kali Linux. As one of many Wi-Fi hacking tools used on penetration testing with kali linux, Reaver implements a brute force attack against Wifi Protected Setup (WPS) registrar PINs in order to recover WPA/WPA2 passphrases. how to change default pdf reader If you want to know how to hack WiFi access point – just read this step by step aircrack-ng tutorial, run the verified commands and hack WiFi password easily. With the help a these commands you will be able to hack WiFi AP (access points) that use WPA/WPA2-PSK (pre-shared key) encryption. Also Read: Hack WiFi Online 2017 WiFi Hacking Tools Alright, i am assuming you have Kali Linux and running on your computer. 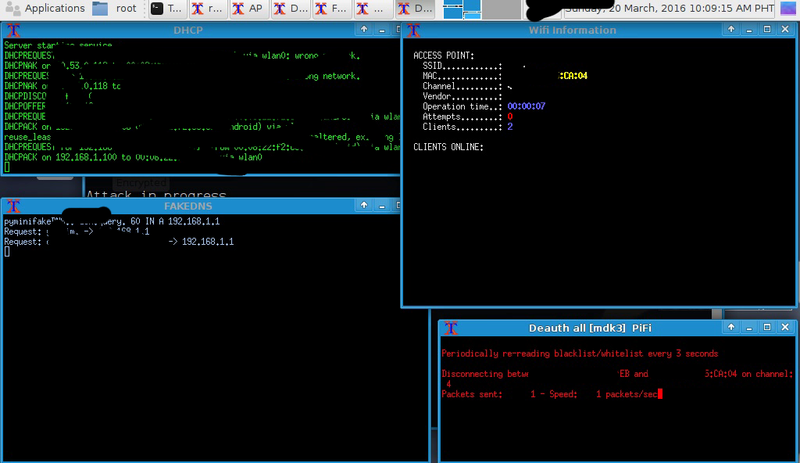 If not, here is a post on hacking with Kali Linux.